Transesophageal echocardiography is a diagnostic test using an ultrasound device that is passed into the esophagus of the patient to create a clear image of the heart muscle and other parts of the heart. 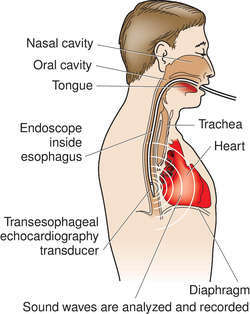 A tube with a device called a transducer is passed down into the patient's throat and into the esophagus (the food tube that connects the mouth to the stomach). The transducer directs ultrasound waves into the heart, and the reflected sound waves picked up by the transducer are translated into an image of the heart. Since the esophagus is right next to the heart, transesophageal echocardiography provides a very clear picture of the heart. It can provide information on the size of the heart, its pumping strength, and the location and extent of any damage to its tissues. It can detect abnormal tissue growth around the heart valves. It is also good at detecting abnormalities in the pattern of blood flow, such as the backward flow of blood through partly closed heart valves, known as regurgitation or insufficiency. It is especially useful in cases in which conventional echocardiography (a test where the transducer is kept on the patient's chest) cannot offer a good image, such as when the patient is obese or has a thick chest wall. It is useful for monitoring heart function during cardiac surgery and detecting blood clots in the left atrium of the heart. Patients should avoid consuming alcohol for a day or so before the procedure, since alcohol may amplify the effects of the sedative used with the procedure. Echocardiography creates an image of the heart using ultra-high-frequency sound waves—sound waves that are much too high in frequency to be heard by the human ear. The technique is very similar to ultrasound scanning commonly used to visualize the fetus during pregnancy. A transesophageal echocardiography examination generally lasts 30-60 minutes. The patient is given a mild sedative and the back of the throat is sprayed with a local anesthetic, in order to suppress the gag reflex. Next, a special viewing tube called an endoscope, containing a tiny transducer, is passed through the mouth and into the esophagus. It is carefully moved until it is positioned directly next to the heart. Essentially a modified microphone, the transducer directs ultrasound waves into the heart, some of which get reflected (or "echoed") back to the transducer. Different tissues and blood all reflect ultrasound waves differently. These sound waves can be translated into a meaningful image of the heart, which is displayed on a monitor or recorded on paper or tape. The transducer may be moved several times during the test to help doctors get a better view of the heart. The patient may be given a mild sedative before the procedure, and an anesthetic is sprayed into the back of the throat in order to suppress the gag reflex. After the test, it is important to refrain from eating or drinking until the gag reflex has returned-otherwise, the patient may accidentally inhale some of the food or beverage. If a sedative has been given, patients should not drive or operate heavy machinery for at least 10-12 hours. They should avoid consuming alcohol for a day or so, since alcohol may amplify the effect of the sedative. Transesophageal echocardiography may cause gagging and discomfort when the transducer is passed down into the throat. Patients may also experience sore throat for a few days after the test. In rare cases, the procedure may cause bleeding or perforation of the esophagus or an inflammatory condition known as infective endocarditis. The patient may have an adverse reaction to the sedative or local anesthetic. A normal transesophageal echocardiogram shows a normal heart structure and the normal flow of blood through the heart chambers and heart valves. A transesophageal echocardiogram may show a number of abnormalities in the structure and function of the heart, such as thickening of the wall of the heart muscle (especially the left ventricle). Other abnormalities can include blood leaking backward through the heart valves (regurgitation), or blood clots in the left atrium of the heart. National Heart, Lung and Blood Institute. P.O. Box 30105, Bethesda, MD 20824-0105. (301) 251-1222. http://www.nhlbi.nih.gov. Endoscope — An instrument used to see and examine the inside of a body cavity or organ. Gag reflex — A normal reflex consisting of elevation of the palate, retraction of the tongue, and contraction of the throat muscles. Regurgitation — Backward flow of blood through a partly closed valve. Transducer — A device that converts electrical signals into ultrasound waves and ultrasound waves back into electrical impulses. Ultrasound — Sound waves at a frequency of 20,000 kHz, often used for diagnostic imaging. recording of the echocardiogram from a transducer swallowed by the patient to predetermined distances in the esophagus and stomach. an endoscopic/ultrasound test that provides ultrasonic imaging of the heart from a retrocardiac vantage point, thus preventing the interposed subcutaneous tissue, bony thorax, and lungs from interfering with the ultrasound. It is performed to better visualize the mitral valve or atrial septum, to differentiate intracardiac from extracardiac masses and tumors, to diagnose thoracic aortic dissection, to detect valvular vegetation as seen with endocarditis, to determine cardiac sources of arterial embolism, to detect coronary artery disease, and to monitor high-risk patients for ischemia intraoperatively. Two-dimensional transesophageal color-flow Doppler echocardiography Cardiology An ultrasonographic imaging modality used to examine cardiac structures–valves, chambers and inflow and outflow tracts and function in which a transducer is placed immediately behind the heart in the esophagus and stomach; because there are no interfering air spaces or bone, the image is superior to that obtained with transthoracic echocardiography and is of particular use in evaluating the status of the endocardium–eg, to identify vegetations on the cardiac valves Indications for TEE ID cardiac source of embolism–35%, prosthetic heart valve malfunction–20%, endocarditis–16%, aortic dissection, cardiac tumor, valvular disease, and others, based on a series of 5000 Pts. See Biplane–intraoperative transesophageal echocardiography, Echocardiography. Recording of the echocardiogram from a swallowed transducer. recording of the position and motion of the heart walls or internal structures of the heart and neighboring tissue by the echo obtained from beams of ultrasonic waves directed through the chest wall. Echocardiography is based on the same principle as the oceanographic technique of depth-sounding; that is, it utilizes ultrasound to delineate anatomical structures by recording on a graph the echoes from the heart structures. It is particularly useful in demonstrating, without danger to the patient, valvular and other structural deformities of the heart which formerly required cardiac catheterization or some other elaborate procedure for accurate diagnosis. See also ultrasonography. microbubbles in liquid are used as a vascular contrast medium. When injected intravenously in a selected or non-selected location, these can be tracked to demonstrate abnormalities of blood flow. the ultrasound probe is mounted on a flexible endoscope and is positioned in the esophagus over the base of the heart, thus enabling unique viewing projections of structures in this area. Q. I am scheduled for a TEE and i am very scared. what is exactly going to happen there? I am scheduled for a Transesophageal echocardiogram (TEE) for my heart valve problem and i am very scared. what is exactly going to happen there to me? I understand i need to swallow somthing and I am not sure I'll be able to do it. I have a strong gag reflex. can someone tell me what I can do to reduce the fear? A. During a TEE you will be requested to swallow something that looks like a big chocolate kiss. This is all the swallowing that is involved. It is not fun, and me too have a strong gag reflex. I asked the doctor to let me watch the TEE of the guy that was before me in the line. After I saw how this test is done it was easier for me. A transesophageal echocardiography demonstrating pulmonary artery tumour embolus involving right pulmonary artery. In a separate study presented at the meeting, he and his Swiss colleagues performed contrast transesophageal echocardiography and cranial MRI in 57 migraine patients and 56 healthy controls. This latex-free transesophageal echocardiography (TEE) cover features a custom tapered design to provide a snugger fit to TEE transducers and provides a defense against cross-contamination. Transesophageal echocardiography and computed tomography suggested an abscess next to the prosthesis and showed vegetations on the prosthetic valve, which suggested endocarditis. Plain chest films were negative, as was bedside transesophageal echocardiography (TEE). This study attempts to determine whether early transesophageal echocardiography (TEE), by ruling out a thrombus, can safely lead to more rapid cardioversion with improved outcomes. 5] Bhagwandien et al reported the first case of pulmonary valve PFE diagnosed by transesophageal echocardiography and confirmed by surgical resection. Transesophageal echocardiography (TEE) is the current diagnostic modality that will effectively visualize these sources of emboli. Although transesophageal echocardiography (TEE) can provide high quality images for diagnosis (1, 2), noninvasive diagnosis of this lesion has been always problematic. Recently, the technique of transesophageal echocardiography (TEE) has provided a new acoustic windowing of the heart and mediastinum.